Deke Sharon the on-set music director and vocal producer of Pitch Perfect and The Sing-Off. 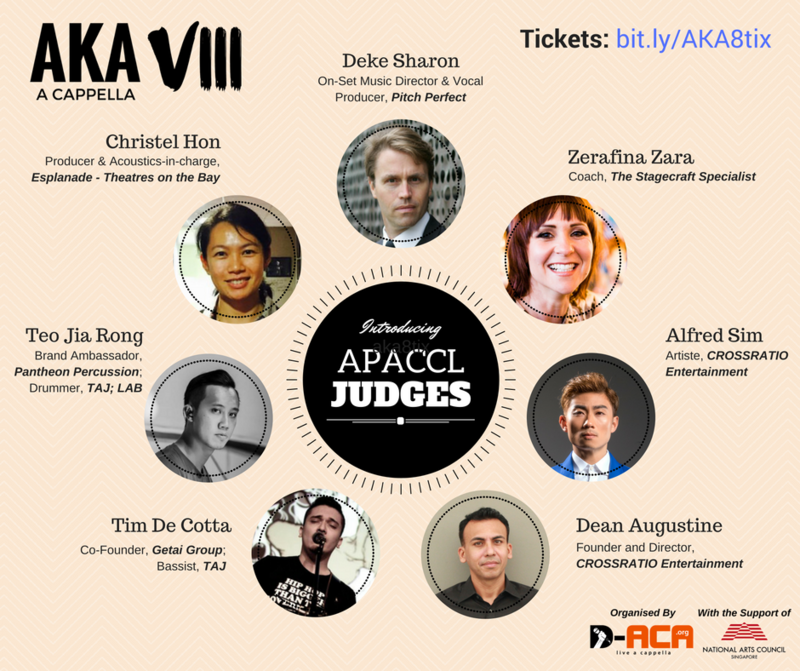 Also known as the “godfather of contemporary a cappella”, Deke has been the musical mastermind behind many a cappella-related productions and organisations. Deke is also a prolific arranger with more than 2000 vocal music arrangements under his belt. Christel Hon is a Producer and acoustics-in-charge at Esplanade - Theatres on the Bay. Christel has been a regular panellist at The A Cappella Society’s A Cappella Championships, and is also the producer of Voices – A Festival of Song, which showcases a cappella groups, show choirs and choral groups as well as encourages the community to come out, have fun and sing. Dean Augustine is founder and director of CROSSRATIO Entertainment, an integrated music entertainment provider specializing in artiste development, music distribution, music publishing, and events planning. CROSSRATIO Entertainment currently manages major local acts such as Tay Kewei and Alfred Sim. Alfred Sim was the winner of the Mediacorp reality program "Project Superstar 2014". Alfred has since released his debut EP in January 2016. Not only is Alfred gifted with a great voice, he is also equally gifted in sports, holding the position of the youth development coach for the Singapore Athletic Association officially since 2008. An experienced drummer, Teo Jia Rong is a regular at local music festivals and an active supporter of the local music scene. Jia Rong performs with local bands TAJ and LAB, and is also the brand ambassador for local custom drum maker, Pantheon Percussion. Tim De Cotta is co-Founder, Getai Group, which has organised numerous large-scale indie music festivals such as Getai Soul and Getai Electronica. An active member of the local indie music scene, Tim is a singer-songwriter, vocalist, producer, and bassist, and performs with numerous local bands such as TAJ, and Tim DeCotta and the Warriors. Zerafina Zara, ‘The Stagecraft Specialist’ is a singer, songwriter, vocal coach and performance craft expert. In the past two decades, Zerafina has taught voice, performance and harmony singing at universities, and coached ARIA and Grammy Award winning artists.